It's spring and it's nice and sunny outside today. I thought I should discipline myself and make it a point to blog once a week despite my busy schedule. This is a summer treat but I suppose we could do spring with it. Spring in Adelaide is rapid, you could see the significant change. The above was taken just two weeks back when it was just the end of winter. This one below, snapped today shows no green leaves, just lots and lots of flower and new flower buds shooting up! Just a shot of my garden. I love the Irish-terrier, Finnigan (it's an Irish name by the way!). He is way too adorable and naughty! Love walking the dog! Mahalepi is a common Cyprus dessert by the Cypriot. I adapted this from non other then Tessa Kiros, my current new idol. Her book, Falling Cloudberries, with a cranberry sorbet as cover page is awesome. These, I would say are like To Fu Fa to the Chinese Malaysian. We consume that as frequent as the Cypriots eat their Mahalepi. Difference is, this is really an acquired taste but I'm glad Aaron and me like it. I guess not everyone is a fan of rosewater but once you've tasted it in your bakings and cookings, you kinda fall for it. Having made this twice, I daresay you will fall for it, usually not on your first attempt! I made this with strong vanilla sugar and I like it better this way. It helped mask the rosewater making it milder and I love the fact that we have lotsa flavours going on here, the rosewater,vanilla, the sweet taste, rice flour taste was rather distinct too and all that smoothed out with milk and water. Have a try! Mix all the above in a pot large enough to accomodate all the liquids and bring to boil, whisking constantly. Continue whisking for a couple of minutes and remove from heat. Leave to cool slightly and pour into four serving dishes. Cool completely and chill in the fridge. Dissolve the sugar in the hot water and leave to cool completely. Add the iced water and put the syrup in the fridge until it get very very cold. To serve, drizzle a few spoonful of syrup over each dish at the last moment. If you want to colour the syrup, add a few red rose petals or cherries. There's a few ways you can serve this. Some like serving this in the cup itself with syrup drizzled over, sometimes with a handful of chopped roasted pistachios. Some like turning it out on a plate and drizzle syrup over so it look more glamorous. The Cypriots scoop them out with a spoon in no patterns and drenched them in the rosewater syrup. I kinda don't like this one because if the syrup is red, it makes the whole thing look like chopped body parts floating in blood. Good for Halloween perhaps! To turn it out on a plate, simply drizzle a few spoonful of syrup along the edges and the edges will loosen itself nicely. Flip it over in a swift motion and drizzle with more syrup. 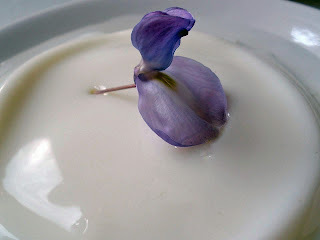 This is quite an easy recipe, really looks like 豆花. It is very easy and you really need to serve this very very cold for it to be yummilicious! Must try this out soon! This dessert also great for Malaysia hot weather :-)Thank you for sharing. also ingredients are easy to get. I have tried Sahlepi and also have some other Greek stuffs in my cabinet that I would use again before my next trip to Greece. I went there in July this year to visit my Greek friend. One more thing, why don't you add the follower gadget thingy??? Maybe I'll use rose tea instead as I don't trust those rose water stuff on our market shelves. I bet they are just imitation rose essence diluted with water, cos most of them are only used for the "adat bersanding" for Malay weddings. You can also use dried roselles to tint them red if you can't find them fresh. Sounds like you had a lot of fun Pixen! Wendy: Thanks but rose tea is just different from rose water. Rose water has a very acquired fragrance, almost like perfume. Perhaps some brands in Malaysia dilute them but here, the one that I'm using, it says 85% rose essence so I'm pretty happy about it. I always check my labelling. You don't need a lot really,just a little would do. It has strong flavour. I have fresh ones in my garden :) Dried roselles might be pretty easy to come by but I just prefer fresh stuffs where possible. As for the follower gadget thingy, no particular reason actually. I just felt it doens't need to be made public, just my opinion. This place is a humble one, if you understand what I mean.